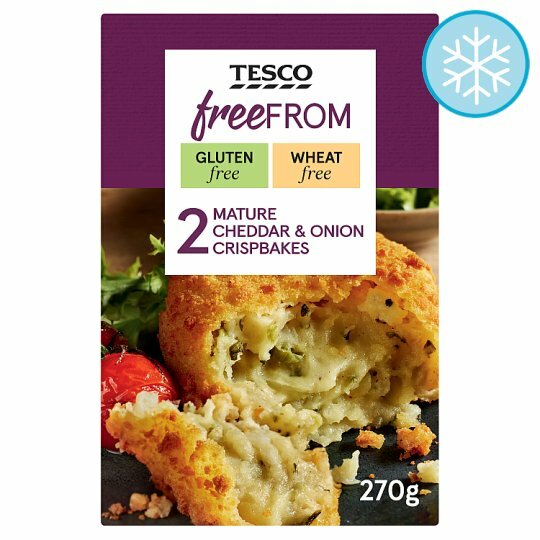 Mature Cheddar cheese mixed with mashed potato and onion in a gluten free cumb coating. INGREDIENTS: Potato, Extra Mature Cheddar Cheese (Milk) (18%), Onion (14%), Spring Onion, Mozzarella Full Fat Soft Cheese (Milk) (6%), Water, Rice Flour, Rapeseed Oil, Dried Potato, Maize Flour, Gram Flour, Whipping Cream (Milk), Potato Starch, Cornflour, Salt, Black Pepper, Dextrose, Nutmeg, White Pepper, Stabiliser (Xanthan Gum). Instructions: Place on a pre-heated baking tray in the centre of a pre-heated oven for 30-35 minutes.